If you did not notice yet, Hidden Springs Flower Farm just released their Last Chance Peony Sale list. I believe they put a sale list up every year at the end of the season, but you never know what's going to be on this list (or when it's going to come out). I think this is a great way to pull in a few extra orders at the end of the season, plus give people an opportunity to order peonies they may not have gotten the chance to order earlier. 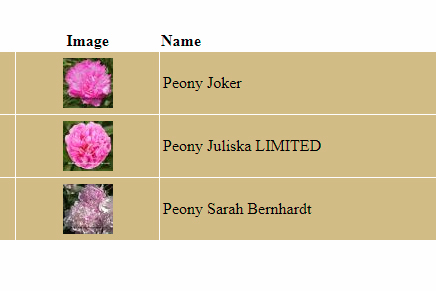 This year I decided to pick up three pink colored peonies - Peony 'Joker', Peony 'Juliska', and Peony 'Sarah Bernhardt'. I really love the picotee edge on the Peony 'Joker'. I've been seeing lots of photos of this one, and it has been on my "Want List". Peony 'Sarah Bernhardt' is a classic double light pink peony, which I don't grow well right now. So I'd like to give her a better place in the garden and a better chance to thrive. Sells Peony 'Juliska' on Sale for $68.00! However I think the real story here is Peony 'Juliska' on sale for $68.00! This peony was fetching $80-$100 a root last year, according to our 2017 Herbaceous Hot 100 Peony Catalog Price Comparison List. This is an even better price than the originator Solaris Farms sells it for this year ($75.00), according to our 2018 Herbaceous Hot 100 Peony Catalog Price Comparison List. This Peony 'Juliska' was hybridized by the late Bill Seidl and Nate Bremer (owner of Solaris Farms), a promising duo that have produced many advanced herbaceous and tree peony hybrids. SOLD OUT Peony 'Bob' on Sale for $112.49! And there's always the one that got away... The first peony I noticed and tried to put in my cart was Peony 'Bob', a rarely offered dark red, almost black peony. However the system told me it was already sold out, how disappointing. Well, I suppose there's always next year... Check out all of the Last Chance Sale offerings on the Hidden Springs Flower Farm list, you may find something you've been looking for!